Back-to-back victories have transformed Sunderland as a source of Fantasy Premier League talent, and four of David Moyes' squad have earned Dream Team call-ups from Gameweek 12. 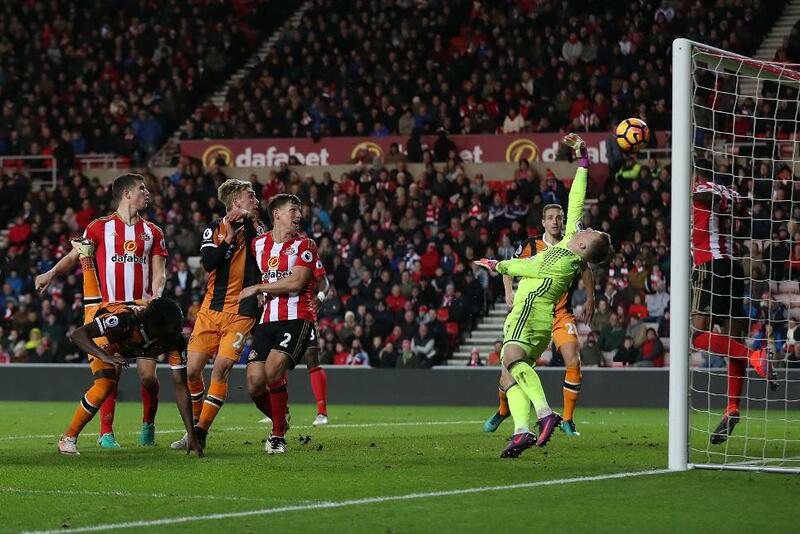 The Black Cats contribute players in defence and attack, with Jordan Pickford (£4.1m) and Patrick van Aanholt (£5.0m) profiting from a first clean sheet of the campaign against Hull City. For Pickford, it is an overdue reward, having contributed 47 saves this season to earn his FPL owners 13 points from stops, second only to Burnley's Tom Heaton (£4.8m), who has produced 63 saves and 16 save points. Van Aanholt earns a second Dream Team appearance of 2016/17, showing his attacking promise with the assist for Victor Anichebe's (£4.6m) first goal in the win over Hull. 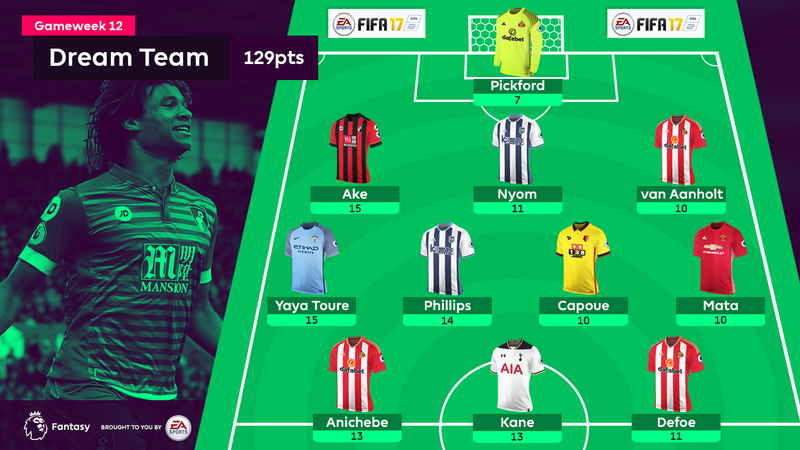 Both Anichebe and strike partner Jermain Defoe (£7.5m) line up in attack, with the latter making his fourth Dream Team appearance, more than any other FPL asset. With double-figure returns in successive Gameweeks, the pair are drawing huge interest from FPL managers looking to shake up their front lines. Top of the FPL ranks for form and value, Defoe has attracted more than 42,000 new owners since Saturday's deadline, while Anichebe has found his way into more than 38,000 squads. West Bromwich Albion are the next major contributor to the XI, with Allan Nyom (£4.3m) and Matt Phillips (£5.1m) earning first Dream Team call-ups. A first Baggies clean sheet since Gameweek 3, along with the assist for Salomon Rondon's (£6.5m) goal, helped Nyom earn recognition. Phillips returned a goal and an assist for the second successive Gameweek to underline his blossoming form and FPL potential. AFC Bournemouth's Nathan Ake (£4.2m) gets a debut Dream Team appearance from his first Premier League start. His goal in the 1-0 win at Stoke City, coupled with a first away clean sheet for the Cherries, earned him 15 points as Gameweek 12's top-scoring player. Players enjoying FPL revivals fill the remaining four spots. A surprise inclusion on Pep Guardiola's teamsheet at Crystal Palace, Yaya Toure (£7.6m) took his opportunity by claiming both goals in Manchester City's 2-1 victory to record 15 FPL points. With a smartly-taken goal and maximum three bonus points from Manchester United's 1-1 draw with Arsenal, Juan Mata (£7.4m) is another to receive a Dream Team recall. Etienne Capoue (£4.9m) returns from a far shorter hiatus, courtesy of his fifth goal and a fourth set of maximum bonus points in Watford's 2-1 win over Leicester City. It is the Frenchman’s third Dream Team appearance. Finally, Harry Kane (£10.8m) earns a debut call-up to spearhead the Dream Team attack. Returning to fitness for the Gameweek 11 derby with Arsenal, Kane followed up his equaliser in that match with a brace in Spurs' victory over West Ham on Saturday. Backed by 21 and 25-goal campaigns in his last two seasons, Kane is set to break into FPL squads ahead of some promising fixtures. After the Stamford Bridge derby this weekend, Spurs host Swansea City, Hull City and Burnley at White Hart Lane over the subsequent four Gameweeks.